There’s an appeal with games that let you easily jump in, learn the ropes, and just play without going through a tedious tutorial or spectacular world building and just play from the get go. In some cases, I see this as a dev’s way of cutting down on cost (and time) in making said game. But there are moments where this kind of cutting down on games is a good thing especially if there’s a solid gameplay, and that’s where Mighty Party comes in. Mighty Party is a free-to-play strategy game for Steam, Android, iOS, and Kongregate. For the sake of transparency, I’ve played the game using the Steam version. In Mighty Party, you take control of a set of units in a 4×6 field where you need to take down the opponent commander’s HP to 0. You take turns putting down units into the field and have them automatically attack during your turn. Other game features include social options like adding friends, gifting them stuff, and a guild system which works just as your typical F2P title where you can communicate, share resources and the like. Mighty Party allows you to go through either through PvE missions or PvP battles against other players in real time. The game also has a few simulation features where you can upgrade a few resources while other structures open up as you rise through the game’s league system. One of the many game units. As you progress, you can acquire units through the game’s loot box system. You can either use regular coin, which increases its price as you open up new ones, or the game’s premium currency system, where you are given a better chance of getting rarer units. You’re going to need these loot boxes because this is going to be the only way you acquire new units in-game. You’re also going to need to acquire similar copies of the unit to increase its stats, aside from the usual level up system where the game caps the level each unit can go depending on the league level you are in. Mighty Party tries to even things out with the game’s level capping system. Matches based on the same league level are pretty much even in terms of levels, but in exchange, you’ll have to contend against players who have a better set of units, meaning, they have rarer characters than you, which happens when you’re up against players who spent more on the game than you. I can’t however totally say that the game is pay-to-win with the way the game randomizes the field as you get higher through the ranks. There will be moments that you can just surrender at the beginning of the match with the field already tilted against you and having opponents who spent money. Meanwhile, aside from the unlockable units you can acquire in-game, Mighty Party’s commanders have skills that you can use in-game similar to how heroes/captains in Heroes of Might and Magic. However, you can only use them once per match so you have to time them properly to maximize their use. The most important action in Mighty Party, the battles are unexpectedly fast-paced. In fact,one of the game’s selling points is how fast the game turnover time is. This makes unit placement important and a bit stressful especially if you’re battling at the higher levels. Another thing that Mighty Party throws into the mix is the addition of the random field structures that affect how the game goes. Some of these structures inflict damage to units or the commander itself, boost HP or damage of opponents or serve as obstructions so that units placed on the same row can provide a tanky structure to fend off attacks from opponents. What I really like about the gameplay design is that you if you play long enough, you can easily determine if the game’s going to be tilted against you or not. This is good because you won’t have to spend time playing a match to find out that you’re sure to lose because of the field setup and who you’re fighting against with. This tilt is more emphasized when freemium players face against the free-to-play players. This disparity between the two is really problematic, especially with the uptake of special snowflake players out there. Thankfully, the game doesn’t have a chat feature in battles so at least the toxicity wouldn’t pass on to matches, well, at least actual toxic chat – people can still spam the commander emotes. Of course, with me mentioning the freemium issue since the start of the review, it’s kind of obvious the game does seem like it’s pay-to-win. However, you can’t win the game with sheer rarity of units, since your winning rate will also be reliant on the field you face off at. Still, it’s still painful to experience those matches where you are just thrown against a player that has tons of epic and rare units in their field. You really can’t wash off the salt it leaves as you lose every single time against these kinds of players. 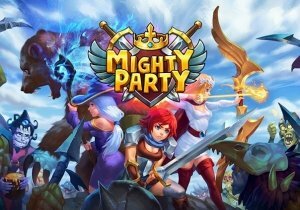 Overall though, Mighty Party is an enjoyable game that’s a good time sink while providing a fast strategy game for both desktop and mobile platforms. It’s a game that provides enough challenge for both PvE and PvP if you’re looking for one, but if you want to really get into it, you really need to spend money on it that is if you don’t have a deep well of patience. It doesn’t hurt that the game is free-to-play, and even if you don’t spend in its cash shop, it still brings enough enjoyment for those dreary days in-between PUBG or LoL/Dota 2 lull moments to scratch that itch or refresh your gaming palette. In short: Solid free-to-play game for both mobile and PC platforms, but feels pay-to-win in the later stages of the game. GungHo Online Entertainment has officially invited players to channel their spirit energy and enter the Dark Tournament. Gravity Interactive has announced the start of ROSE Online's summer festival.